My local Winco grocery store, has a ton of food products for very inexpensive. They even have weirder items like cactus, all kinds of authentic Mexican foods, so many tortilla brands you wouldn't know which to choose, and various other strange items that you can only get there. On one shopping excursion, my mom and I discovered some frozen cornish hens that we impulse bought. I decided to use them for our Easter dinner, instead of doing ham or something else. I roasted them very simply, made scalloped potatoes as our side, and made the rosemary rolls from my last post, since we still had frozen dinner rolls. 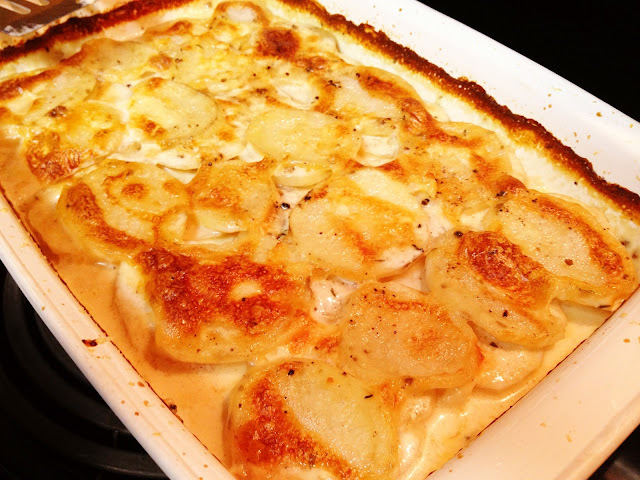 The chicken came out really tender and juicy, and the scalloped potatoes were creamy and delicious. 2. In a saucepan, heat up the cream with a sprig of thyme, chopped garlic and nutmeg. 3. While cream is heating up, butter a casserole dish. Place a layer of potato in an overlapping pattern and season with salt and pepper. Remove cream from heat, then pour a little over the potatoes. Top with some grated Parmesan. Make 2 more layers. Bake, uncovered, for 45 minutes. Sprinkle some more Parmesan and broil until cheese browns, about 5 minutes. 2. In a small mixing bowl, stir together salt, lemon pepper, dried basil and poultry seasoning. Rub olive oil all over the hens and season each with the salt mixture. Place the hens on a baking sheet pan with plenty of space between them. You may need to use 2 pans. Loosely stuff the cavities of each hen with some green bell pepper, celery and onion. Roast the hens in the preheated oven for about 1 hour or until an instant-read thermometer inserted into the thickest part of the thigh registers 165 degrees F and the juices run clear. 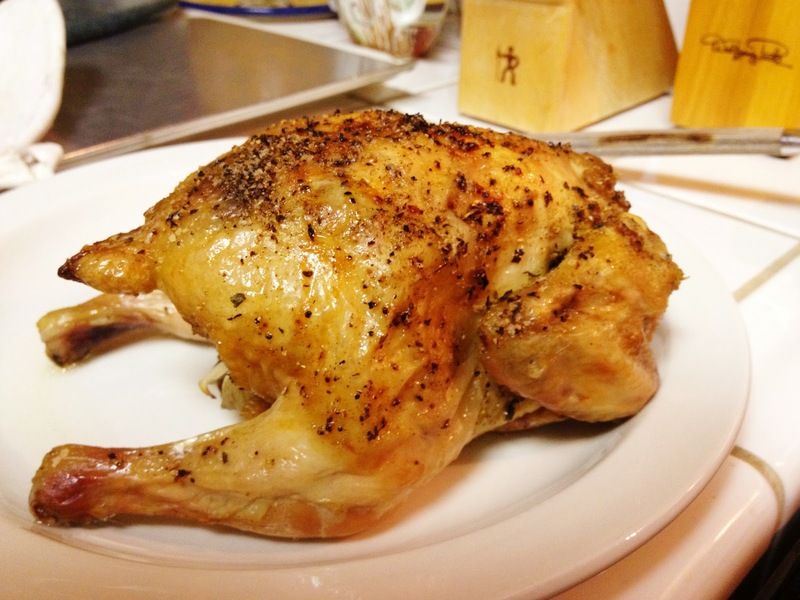 Remove the hens from the oven, loosely tent with foil and let rest 10 minutes before carving or serving. TIPS: Line the baking sheet pan with foil under the wire rack for an easy clean-up. The veggies and herbs stuffed in the cavities of the hens will impart flavor to the meat as it cooks.